Tonight’s contest began with a pre-game ceremony to honour Gens alumni Terry Vail, George Vail, Ian MacNeil, Wade Simpson, and Matt Hoffman who dropped the ceremonial puck to kick off the evening. Oshawa opened the game strong by getting several early chances on Niagara’s net but IceDogs goaltender Stephen Dhillon was able to turn them away. Just over eight minutes into the game, Niagara came close to opening the scoring but hit the post on a chance from the slot that Gens goaltender Kyle Keyser then scooped up to deny the chance in front. In the latter half of the period, Keyser kept up his solid play as he made several important stops to hold off the IceDogs offense. In the last few minutes of the period, Niagara received the first penalty of the game for high-sticking to put the Gens on a powerplay. While Oshawa didn’t score on their first attempt, they got another try on the man advantage after the IceDogs took another penalty for high-sticking immediately after the first one ended. This time around, Oshawa made no mistake on the powerplay opportunity with Brandon Saigeon flipping the puck past Dhillon at the side of the net to put the Gens up 1-0 heading into the first intermission. The Gens got off to a rough start to open the second period with the IceDogs getting their first goal of the game on a shot from the slot to tie the contest at 1-1. Just over three minutes into the period the IceDogs got called for a tripping penalty to put the Gens on the powerplay. Half way through the man advantage chance, both teams took penalties to put the play at 4-on-3 shortly before turning into 4-on-4 hockey. After Oshawa’s player returned to the ice to get a short powerplay, Giovanni Vallati capitalized on the chance by ripping a shot top corner from just inside the blue line to give back Oshawa’s lead. Just before the period’s halfway mark, the IceDogs took a penalty for delay of game to put the Gens back on the powerplay. While they got some chances, Oshawa couldn’t get one with the man advantage. Shortly after, the Gens took a penalty to give Niagara a chance on the PP. With a strong penalty kill effort, they were able to hold off Niagara’s offense. In the dying minutes of the second, Gens captain Kyle MacLean snaked his way into Niagara’s end before dishing a perfect pass to Nando Eggenberger who buried a shot past Dhillon to put the Gens up 3-1 to enter the game’s final period. The period began with both teams taking the play back and forth with speed. However, it was the IceDogs who were able to get one past the Gens on breakaway chance that they managed to pot to put the game at 3-2. The Generals were hemmed in their own end for a good portion of the period’s opening half but managed to keep their one-goal lead with the help of some big stops by Keyser. In the latter half of the third, the Gens continued to hold off the IceDogs offense as they made a push to try to tie the game, but Oshawa’s defense remained solid. 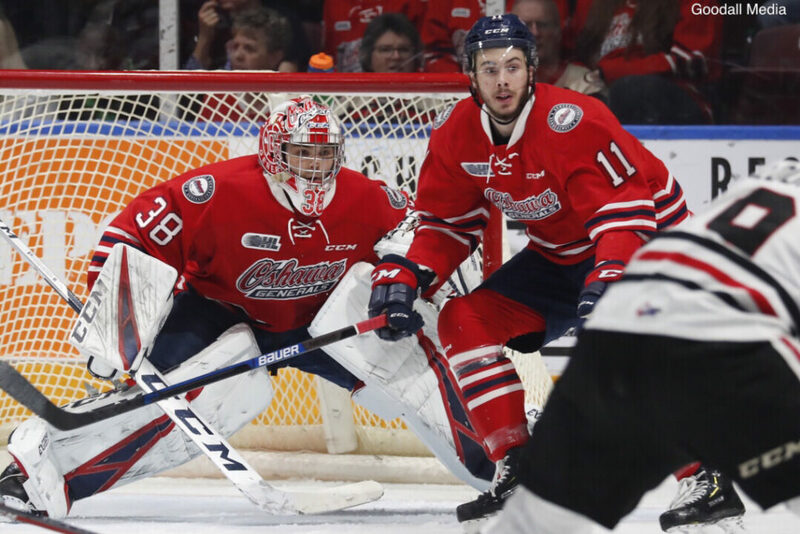 In the last minutes of the period, the IceDogs attempted to make a final push with their net empty, but the Gens stood tall and denied any chances to hold onto their 3-2 lead and claim the series win over Niagara! With an incredible 4-straight wins to defeat the Niagara IceDogs 4-2 in the second round, the Generals have advanced to the Eastern Conference Finals where they will battle the Ottawa 67’s for a ticket to the OHL Championship! Tickets for Round 3 can be purchased online by clicking here!